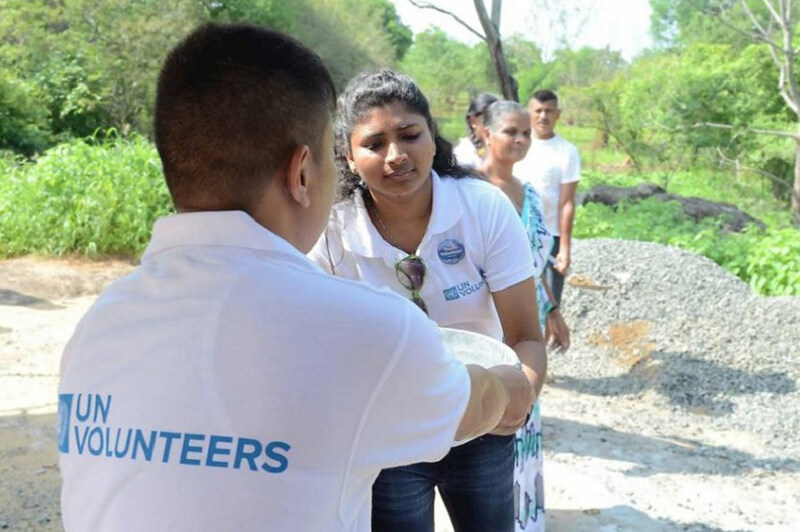 Youth volunteers mobilized through the United Nations Volunteers (UNV) programme in India address the developmental gaps highlighted under the country's National Youth Policy. Deployed in all states of the country, the 29 national UN Volunteer District Youth Coordinators are facilitating greater youth participation and voice in sustainable development programmes. Afshana Khathunis, a National Service Scheme Volunteer Awardee from India, engages with the community members as a National Youth Volunteer in Nehru Yuva Kendra in Mangalore, India. Deployed in all states of the country, the 29 national UN Volunteer District Youth Coordinators are facilitating greater youth participation and voice in sustainable development programmes. Various activities have been designed from both national and district level to engage youth at large and provide them relevant information addressing their local challenges. Based on the community problems with top priories in different region, the deployed National UN Volunteer District Youth Coordinators have mobilized youth to volunteer for the local communities. The project has led to the formation of additional youth clubs and innovative ways of engaging with youth in volunteering for community development, skills development, and communication. The project has led in formation of 7,296 new youth clubs with more than 117,012 youth volunteers as members in 29 districts of India. Engaged 3,000 youth volunteers through 27 thematic debates on promotion of youth volunteerism in rural youth with special focus on Sustainable Development Goals. Framework for recognition of proactive youth volunteers has been developed in collaboration with key stakeholders including private sectors. Youth development and volunteering activities in different communities mobilized 285,437 volunteers in total. The project successfully provided catalytic support to the Youth Volunteer Schemes in the country and facilitate greater youth participation in volunteerism and sustainable development in the communities. According to Ankit Jaiswal, a national UN Volunteer Management Associate serving with UNDP under the 'Strengthening NYKS and NSS' project, Indian youth have learned to address the developmental gaps and develop their skills to work as professionals which directly impacts in nation building in India, which has the world’s largest population of young people. In Drought-Stricken Ernakulam, How We Revived 150 Ponds In Just 60 Days: with the alarming rate India’s natural water resources dying, people in Ernakulam District of Kerala have come together to revive the ponds, which were once the main source of water in many areas of the district. From having around 3,000 ponds in 1980s to just 600-700 ponds by 2016, ponds in Ernakulam district were dying a slow death. In order to give a second lease of life to the ponds, the District Collector started a project ‘Entekulam Ernakulam’ (my pond Ernakulam) under the government’s Haritha Keralam (Green Kerala) Mission. This initiative was led by Toney Thomas, national UN Youth Volunteer District Coordinator who was also awarded by Hon. Chief Minister of Kerala Shri Pinarai Vijayan for his work on volunteer mobilization for a project by district administration called 100 ponds in 50 days. This video on the social entrepreneurship programme, heralded by UNV-DYC, shows How Women In Rajkot Are Becoming Entrepreneurs. The programme provides vocational training to women in the Rajkot district on local handicrafts and embroideries. This has resulted in women becoming financially independent and employing more people as demand for their artisanal work has been high. This programme also provides linkage to the market for the women entrepreneurs to sell their handicrafts. The activity comes under Skill Upgradation Training Program (SUTP) which is one of the core activities to be done under Annual Action Plan of NYKS. In a Patriarchal Uttarakhand Village, How One Man Is Defying the Norm to Educate Girls: Shiv Semalty, national UN Volunteer, has been working towards challenging traditional norms and bringing change in the lives of youth living in Uttarkashi through introducing digital technology for youth in the area by setting up a computer training centre which were accessible for the youth. Initially, the centre was frequented only by men, as there was no such facility for women. But after a lot of women expressed their interest, Shiv ensured that a female teacher was recruited. Soon enough, women students started enrolling in the computer centre. Furthermore, to promote women participation, Shiv also initiated stitching classes in the centre which supported women to build their skills. Today, as part of NYKS’s initiatives, over 200 young women are either a part of these initiatives, making them be more self-sufficient and save money. .
As shown in this video, Creating Jobs For Persons With Disabilities In Tikamgarh, Madhya Pradesh, Gyanendra Vishwakarma, national UN Youth Volunteer District Coordinator with the help of Rural Self Employment Training Institute, Tikamgarh, has initiated training on motorcycle repair for 20 Person with Disability (PwD) for a period of two months. Out of the 20 participants, one has been hired by Bajaj Motors workshop and one of the other participants has secured government loan to start his own local motorcycle repair shop in his village. Thei above articles and videos were publicized as part of #Restless4Change, a campaign by UN Volunteers and Youth Ki Awaaz to highlight work done by UN Volunteers as part of the Nehru Yuva Kendra Sangathan (NYKS) and National Service Scheme (NSS), across 29 districts in India.